I feel like I've been away from home for weeks, in the sense that I just feel out of my routine. It's so odd! But now that I'm home from NY and I don't have anything major planned for a while (until October, when I have the Detroit Marathon), I am glad to be back to the norm. Taking a break from the blog was nice, but not so great for my eating. Most days, I did really well; but I overate a few times (going over my PointsPlus). And yesterday, I had a mini-binge. Technically, it probably wasn't a binge, because I didn't lose ALL control; but in my eyes, it was. So, I have to restart my binge-free streak from zero. I do so much better when I am in a solid routine, and last week was completely out of the norm for me. I decided to talk to my physical therapist about changing up my marathon training. Right now, I'm combining Jeff Galloway's plan with Hal Higdon's plan, and it's just not working out. Galloway's plan is two 30-minute runs per week plus one long run. The problem with that is when you have a bad long run (like I did a couple of weeks ago), it's a HUGE chunk of your mileage that gets messed up. The plan that worked best for me was Hansons Marathon Method, but it's a ton of mileage, so not the ideal plan for getting back to running after an injury. Even though the long run only goes up to 16 miles, I felt more prepared than ever for the Chicago Marathon. That's the plan I'd hoped to use for Detroit. Anyway, what I'd like to do (and have to talk with my PT about) is to start transitioning to Hansons. I would start by adding a fourth day of running, and then use cross training (deep water running or biking) for the other two run days. After a few weeks, if I do okay with that, I can swap in a fifth run day for one of the cross training days. And a few more weeks after that, I'd make the switch over to the sixth run day and follow the schedule as planned. I would continue to do the run/walk intervals through the program. I sent my PT an email about it today, so I'll decide once I hear back from him. Yesterday, I ran four miles instead of three, and it went really well. If I'm going to increase my mileage, I decided I'd better take my easy runs REALLY easy, so I took the pace nice and slow. I felt really good when I was done. I'm actually looking forward to increasing my mileage if my PT says it's okay! My parents are camping for a few days, so they invited us to the campground yesterday with the kids. We brought Joey, and spent a couple of hours on the beach. Joey's favorite game is chasing after rocks in the water. It was cute to see the kids get in and play with him. 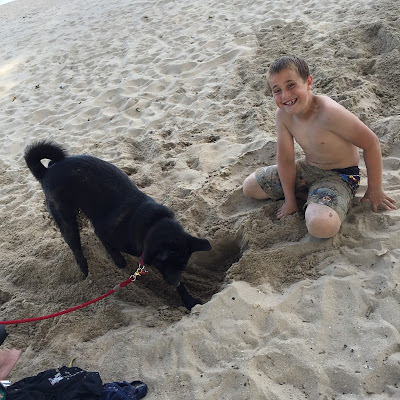 Eli started digging in the sand, and Joey thought that was a super fun game! 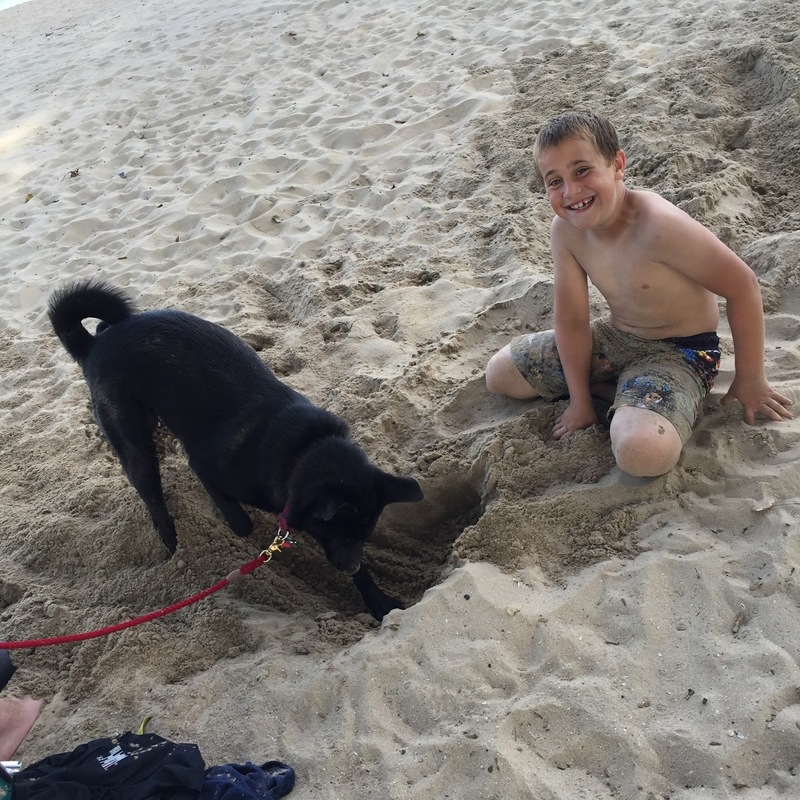 It was hilarious to watch him dig, because he could dig ten times faster than we could. Then he would stick his face in the hole he just made, and come out with sand all over his nose. Eli was laughing non-stop. It was a gorgeous day for the beach, too! It was warm, but not very sunny, so it wasn't miserably hot. There was a nice breeze, and not very many people on the beach, so we had a huge chunk of it to ourselves. Are you no longer running the Hippie Half in Hell this year? I thought I remember you talking about doing the half while your brother does the ultra. I'm not registered for it, because of the stress fracture changing all of my running goals, but if I don't do the race, I'll still either volunteer or spectate. I'm looking forward to that!